Love, loss, and connection are the threads that bind together this moving story set in a residential home for seniors. Anna Forster, age 38, knows that her early-onset Alzheimer’s can only get worse, especially after seeing her mother deteriorate rapidly with the same condition years earlier. With her own agreement, Anna’s twin Jack checks her into Rosalind House, a small private care facility that can keep her safe and provide for her needs. As an added bonus, there is one other younger resident there, so Anna won’t be alone among the elderly. Luke (or Young Guy, as Anna thinks of him, having lost her ability to master names) is suffering from a different type of early-onset dementia that impacts his speech and language abilities — but despite their challenges, the two quickly connect and form a bond that strengthens day to day. Meanwhile, in another plot thread, Eve Bennett is newly widowed, a young single mother struggling to provide for her daughter after the scandal of her husband’s involvement in a massive Ponzi scheme costs them everything. Eve had gone to culinary school years earlier before marrying Richard, and she falls back on her cooking skills in order to secure a job as cook and housekeeper at Rosalind House. As Eve tries to rebuild her life, she’s increasingly drawn to Anna and Luke, now forcibly kept apart by the facility’s staff. What has happened to require them to be locked into their rooms at night? And why does Anna, in a rare moment of lucidity, grab Eve’s hand and ask for help? Told through the points of view of Anna, Eve, and Eve’s young daughter Clementine, the shifting narrative voices unite to paint a picture of this world that can only be partially seen and understood by any one of the three. Anna’s voice is the most compelling, and by necessity, also the least reliable. Anna is relatively coherent when she first arrives at Rosalind House, but as her disease worsens, her narration develops gaps as well. She loses individual words, cannot tell which door leads to a closet and which to the hallway, and has less and less tolerance for noise or sudden, unexpected stimuli. As she narrates the story of her time at the home, the reader is drawn into the horror and terror of a young woman feeling her mind slip away, wanting desperately to hold onto what matters, but knowing that she’s in a losing war against time. No one trusts anything I say. If I point out, for example, that the toast is burning or that it’s time for the six o’clock news, people marvel. How about that? Is is time for the six o’clock news. Well done, Anna. At the beginning, I was reluctant to switch over to the Eve chapters, not quite seeing the point of her storyline or why we needed this plot thread, reminiscent of both the real-life Bernie Madoff scandal and the movie Blue Jasmine. Bit by bit, though, I was drawn into Eve’s story as well, coming to care about her and her daughter and their struggle to move forward and rebuild. Beyond that, it ‘s quickly apparent that Eve is a necessary key to the plot as a whole, and a very clever choice on the part of the author. Because of Anna’s condition, we can’t get a full picture of events from her alone. Eve provides another set of eyes and ears, a caring and sensitive witness to Anna and Luke’s story, and ultimately, a catalyst for helping them hold onto the shreds of happiness they’ve managed to find amidst their own personal tragedies. The timeline of the plot weaves back and forth between past and present, with Anna’s story beginning with her arrival at Rosalind House, and Eve’s starting fifteen months later. Between the two, we start to learn what happened to Anna and Luke, with Eve’s current interactions with them finally filling in some of the blanks. The Things We Keep is heartbreaking yet not altogether bleak. Seeing Anna’s decline is painful, and I can only imagine the horror of watching this strong, vibrant young woman slowly lose herself to a disease that can’t be stopped. At the same time, her connection with Luke is lovely and unexpected, and I couldn’t help being moved by this surprising discovery of grace in the middle of loss. 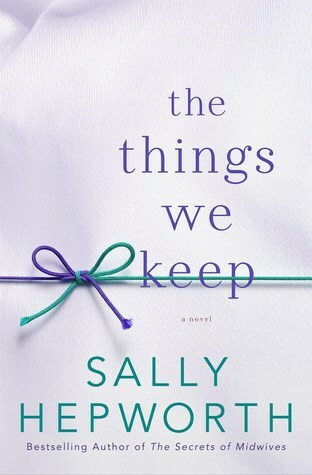 The Things We Keep is a sad story, beautifully told. While the tragedy of Anna’s decline can’t be lessened, there are rays of hope and joy, both as Anna’s story comes to an end and as Eve and her daughter finally arrive at a new beginning. I highly recommend this book, and look forward to reading the author’s previous novel, The Secrets of Midwives. Just finished We Are Not Oursekves by Matthew Thomas, another story about Akzheimer’s disease. The Things We Keep sounds equally good! I’ll have to check that one out as well! I really liked this one as well, but I can also put in a recommendation for We Are Not Ourselves. Great to know — thanks! This sounds like an emotional roller-coaster of a read, but worth the investment! I’m so glad you enjoyed this one. I shall keep an eye out for it on bookshop shelves. Yes, it’s quite powerful, and I’m so glad to have read it! I hope you get a chance to check it out.